The empty lot soon became the long-term focus of a demand for social housing in the Downtown Eastside. The lot at 58 W Hastings has been at the heart of numerous campaigns since 2008, including the Downtown Eastside Neighborhood Council’s “Ten Sites” campaign, and more recently the Our Homes Can’t Wait campaign. During the 2010 Winter Olympics the property was also occupied by the Olympic Tent City. Now, almost ten years later, the battle over 58 W Hastings continues. 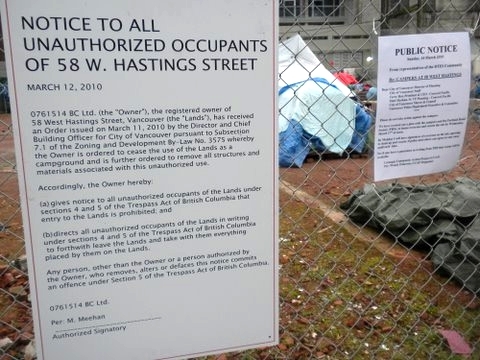 Homelessness and community resistance have now culminated this month in a second tent city at 58 West Hastings. The tent city erected since Saturday, July 9th – one part direct-action and one part emergency survival – is a critical response to a homeless count and homeless deaths that continue to grow as Gregor Robertson’s expired promise of ending the homelessness crisis fades into the distance. As rents continue to rise in SRO hotels, and with record-high homelessness numbers, the time is now to mobilize around social, affordable and welfare-rate housing at 58 W Hastings. “Somebody knocked down all the stores, then it was capped and sealed and surrounded by a chain-link fence, and almost immediately a development permit sign went up that read, ‘This project has been approved by the director of planning.’” Later it would be revealed that Concord Pacific was behind the proposal. Titled “Greenwich” after the village in NYC, the City did not view Concord Pacific’s project as a major development because it was deemed to fit within the existing zoning limits and as such did not require additional community consultation. 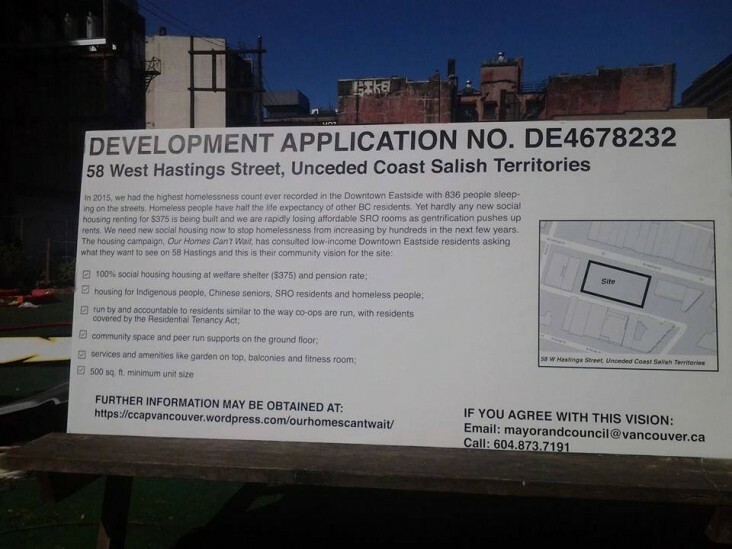 DTES community residents and the Carnegie Community Action Project were quick to mobilize against the proposed plans for 58 W Hastings Street. In the summer of 2008, CCAP attempted to pay Terry Hui of Concord Pacific several visits to dissuade him from moving forward with the plan to build “swanky condos.” On June 13, 2008, they arrived at his office bearing gifts which included a jar of bedbugs and a giant card, asking Mr. Hui to reconsider the development and instead invest in social housing and name the project after Darrel Mikasko. Each time, the Downtown Eastside residents were denied entry and their requests to meet with Mr. Hui were refused. But the events would launch a decade of struggle around the future of 58 W Hastings. In June organizers moved their efforts to City Hall. On June 23rd, 2008, with 201 letters of support in tow, over 40 activists and residents crowded the Development Permit Board hearing to voice their concerns about Concord Pacific’s proposed 154-condo project. Despite the overwhelming opposition and concern about the proposal, City housing planner Jill Davidson assured the Development Permit Board that the city’s policy of replacing each lost SRO unit with a unit of “social housing” was being met. On July 5th, 2008, a mock funeral procession was held in response to the decision at City Hall’s development permit board. The community gathered at Pigeon Park and made their way down to 58 W Hastings, and then finally ending at Concord Pacific’s showroom on North False Creek. Throughout the procession they carried tombstones representing hotels that had already been lost to market development and gentrification. During the march, Dave Diewert of Streams of Justice performed a piece of street theatre that drew parallels between colonization and gentrification, with developers descending on the Downtown Eastside like neo-colonizers. “Today we have new explorers; they are the large real estate developers who are invading the community of the Downtown Eastside in order to appropriate the land and acquire for themselves great wealth.” The analysis was an accessible way of understanding both historical and structural oppression and repeated displacement on Unceded Coast Salish territory. In 2008 the global financial crisis put a pause on developments underway across Vancouver, including Concord’s 154 units of condos at 58 W Hastings. Before and during the 2010 Winter Games, Olympics planners (“VANOC”) arranged to use the empty Hastings Street lot as a parking and storage space for trucks and Olympics-related equipment. But the community had different plans, and by early February the pieces were in place for a radical alternative at 58 W Hastings that would last throughout the Games. Sympathy across the city surged, building on the nearly 100 groups who endorsed the opening action. 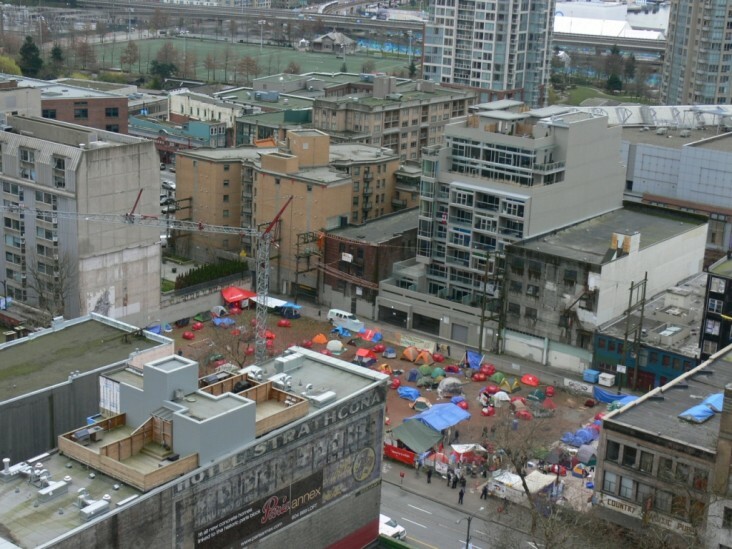 But since the erection of the very first tent, the City of Vancouver exerted continued legal pressure as well as police infiltration at the site. In late February the local government escalated its opposition and issued an official eviction notice. While the community was ultimately unable to stand up to police repression, the tent city highlighted the power of self-organized resistance and pointed to the glaring contradictions of a city built on capitalism and land theft. 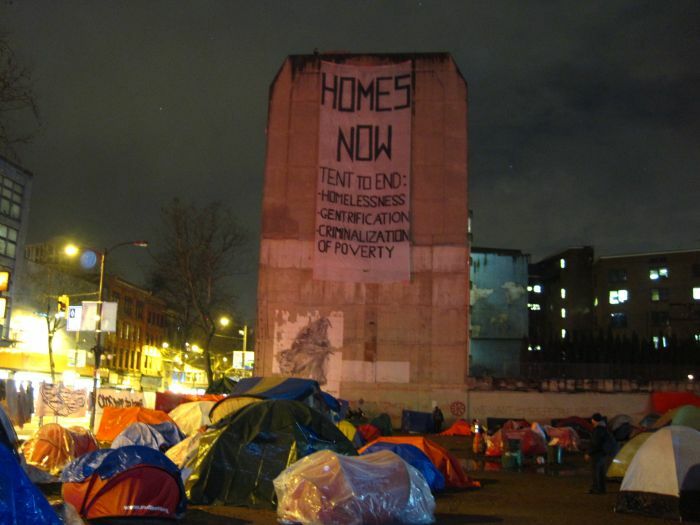 It has also been characterized as a “win” because a short-term demand of the action was met – to house all homeless residents living on the site. In 2011, Vision Vancouver freed Concord Pacific from its legal obligation to provide social housing in their planned high-rise condo developments along False Creek. Municipal inclusionary zoning laws require that developers build 20% social housing into all “large developments.” If followed (inclusionary zoning is often ignored in Vancouver), Concord would have been forced to build hundreds of units of social housing. It should be recalled that during this period, social housing was still a real thing – it would still be another few years before Vision’s city council voted to gut the definition. Instead of enforcing its inclusionary zoning law in 2011, the City decided to grant the developer a special way out through a land swap involving the exchange of 58 W Hastings and another site at 117 E Hastings. Once in city-owned hands, these sites could in theory be used for social and affordable housing – a possible win for the community after years of struggle. But so far no substantive plans for social housing have been laid. In the interim, the Portland Hotel Society has been allowed to run the site, erecting a community garden in 2012 and using the space for much-needed community programing, festivities, and ceremonies. The vision developed for 58 E Hastings at Our Homes Can’t Wait townhalls. During the post-Olympic years the downtown eastside community continued to pressure for affordable and social housing at the symbolic site. From 2011-2012 the Downtown Eastside Neighborhood Council organized its “Ten Sites” campaign, citing 58 W Hastings as one its key properties. More recently the Our Homes Can’t Wait campaign has again pushed for housing on the site. In May of this year they organized a “paint in” at 58 W Hastings to demand 100% social housing at ten sites in the Downtown Eastside including 58 W Hastings, measures to improve and save SRO hotels as well as rent control. Today’s encampment at 58 W hastings builds on the momentum of resistance across BC, with ongoing tent cities in Victoria, Abbostford, Maple Ridge and elsewhere. The tent city was also launched as part of a national day of action coinciding with a tent city in Kitchener and housing actions across Canada. But most importantly, as the residents of the tent city prepare to meeting the Mayor next week, today’s action at 58 W Hastings builds on a history of organizing at the site itself. It is the latest chapter in a principled and sustained campaign for housing justice. Last summer the City announced 58 West as the home of one of the Vancouver Affordable Housing Agency’s (VAHA) seven sites of “affordable housing.” The preliminary plans indicate that only 15% of units will rent at shelter rate, despite record high homeless counts and an unprecedented loss of SRO rooms in the Downtown Eastside. If these plans are allowed to go through, the overall effect – like Woodward’s – will be displacement and a continued overall loss of affordable housing. For years the community has insisted on the importance of protecting 58 W Hastings, pointing to the overall affordability failures of the Woodward’s model looming at the end of the block. They have argued that, with or without Harper, Trudeau and Christy Clark, the city can and must protect affordable sites and set aside land for non-market housing. Now it is time for the city to stop deflecting full responsibility onto other levels of government and onto vague economic forces outside its control. It is time to honour the community’s unified demands for housing at 58 West Hastings. Posted in Downtown Eastside, History, Housing. Bookmark the permalink. A couple of questions. I’m glad to see you mention to Portland Society. But I did not see any mention of their questionable spending habits. Did not they travel to Disneyland at cetera on money that was supposed to be spent on the downtown east side? I believe one of our former local MLS benefited from that experience. And if memory serves she only paid the money back once it became a new story. Second Point am I correct that over 1 million dollars of public money is spent each day on the downtown Eastside social programs? If that’s not true what is the estimated number? How much would be enough?